It Doesn't Get Any Sweeter! Our owlet Adi is named after the state capital of South Australia. Founded in 1836, Adelaide is the 5th-largest city in Australia. In addition, Adelaide as a girl's name is pronounced AD-a-layd. It is of Old German origin, and the meaning of Adelaide is "noble kind". The name was first popular in England after the reign (1830-37) of William IV and Queen Adelaide. Hunter is named after the Hunter Valley, a region known for its fine vineyards, horse breeding, and tourism along the mighty Hunter River. It is a region of New South Wales, Australia, extending approximately 75 190 miles north of Sydney. Over 30,000 years ago the Wonnarua tribe of aboriginal Australians inhabited the land that is now known as the Hunter Valley region. Along with the Worimi tribe to the north and the Awabakal to the south, the Wonnarua developed a trading route connecting the Coquun (Hunter) Valley to the harbour now known as Sydney harbour. European settlement of the Sydney region of Australia began in the late 18th century as a colony of the British Empire. The Hunter River was discovered by accident, in 1797 by British Lieutenant John Shortland. The region soon became a valuable source for timber and coal that fuelled the steamship trade. Anecdote: One of Australia's most highly regarded songbirds, the Australian Magpie happens to be the mascot of Kanga's favorite Aussie Rules Football Team, Collingwood - Go Maggies! No, not short for boomerang, but we hope he returns to visit us often! Talk about coincidence - incubation time 31 days, 0 hours, 0 minutes !! Roo... is it short for... ummm, Roooo? The smallest one in the family is sure to be a bounder of adventure in this 'leap' year clutch. Named after the "unofficial" Aussie national anthem "Waltzing Matilda"
Named after the Aussie character Crocodile Dundee of movie fame. Played by actor Paul Hogan, who started his career as a painter on the Sydney Harbour Bridge, and later entered a talent show on TV. The Box-builder/owner is originally from Mel(bourne), Downunder (+proud U.S. citizen as well), hence the Aussie names chosen for the first clutch of owlets in 2011. The relatively warm winter weather in San Diego County always seems to bring the owls into the box much earlier than elsewhere - but we're running a little later than in previous years. Check back often to see how Mel and Sydney learn to become parents all over again, CAMs will be broadcasting the action as often as possible. Sorry, no merchandise will be available about Mel & Sydney - my house, my yard, my box, but EVERYBODY'S owls. The gift we get is the privilege of watching these lovely creatures. If you'd like to benefit barn owls or wildlife in general, then make a donation to an organization in your area. 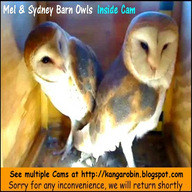 $$$$$*$ - Mel & Sydney video and audio streaming, internet and wi-fi services, materials, equipment, cameras, power, time, dedication, designs and innovations for the well-being of these wild and free barn owls are all donated solely by the OWNER for the viewing and learning enjoyment of all. Absolutely no payments are made to Ustream, nor is income, revenue, or compensation of any kind received from any organization or entity, advertising, sales, or any other source whatsoever in association with Mel & Sydney Barn Owls of Oceanside, CA. All images and sounds derived from video streaming of Mel & Sydney barn owls constitute User Created Content (UCC) and remain the property of the owner under the copyright laws of the United States. No unauthorized reproduction of images or sounds may be made without written consent of the content owner, including but not limited to any commercial use, sale, or distribution thereof. Content may be reproduced under Fair Use terms of copyright law for personal use, free public posting, and media reporting.